ISBN 0 312 25193 9. At the height of the industrial expansion of North America, the pollution of the Great Lakes was widely accepted as unavoidable. The polluting industries  steel, chemicals, aluminum, soda ash and heavy manufacturing  were located on their shores to take advantage of the abundant water supply, access to ports and inexpensive power. With the rare exception of Chicago, the cities turned their backs to the lakes and largely put them out of mind. Over the past few decades, the lakes have been rediscovered. Everywhere, cities are building new waterfront facilities, resorts have been revitalized, the voices of Native nations have been raised, and ancient traditions revived. The commitment to revive the lakes was renewed at the first meeting of the Great Lakes Collaborative, borne of a presidential directive for all federal agencies with Great Lakes responsibilities to coordinate their activities. At this meeting in Chicago in late 2004, governors, mayors, commissioners and American Indian chiefs marched behind flags and bagpipes into a grand ballroom filled with environmental advocates, scientists, reporters and bureaucrats. Coincident with this meeting, I was reading The Living Great Lakes, by Jerry Dennis. While reading it, I also thought, at last. Finally, here is a book on the Great Lakes that is alive with a tone of awe and respect, one that presents the fascinating details of bathymetry and limnology, chemistry and biology, and meteorology and geography in the context of a great sailors story rather than in the dry tones of an atlas. Not since the old childrens book Paddle to the Sea, where a doll rode a toy canoe down perilous rapids and a lonely expanse of lake to the sea, have the Great Lakes been presented as the grand adventure they are. This adventure takes place aboard the Malabar, a replica of the workhorse schooners that, at the beginning of the 20th century, carried vacationers and tourists from Great Lakes cities to the popular playgrounds of the Thousand Islands and Mackinac Island. In the late 1980s, investors thought that the lakes might once again attract people for pleasure cruises. But by the first years of the 21st century, that dream was abandoned. And so the Malabar, its cement hull patched together by the colorful captain and his makeshift crew, makes one final sail from Michigan to the profitable tourist market along the coast of Maine. Ironically, the journey on which the author takes us is a farewell voyage. Its just the right metaphor for the books message: Take a close look at our lakes before theyre gone. Theres nothing like a seagoing adventure to remind us of the capricious and unexpected mood-shifts of nature. Even more than most waters, the Great Lakes have a way of surprising us with sudden winds and fickle currents. Great Lakes mariners worked hard to know the lakes intimately, as their lives and the lives of their passengers depended on it. And even as Dennis writes eloquently about the power and beauty of the lakes, he chronicles the many dangers that threaten their future: the steady influx of invasive plants and animals that hitch rides in the ballast of cargo ships, the rising pressure to remove water from the lakes to feed the thirst of expanding suburbs and perhaps someday drought-ravaged prairies, and the continuing flushing of industrial, agricultural and urban wastes from some of the largest U.S. and Canadian cities. This book, while lighthearted and adventurous throughout, reminds us without preaching that our lives, too, depend on the lakes in more ways than we usually notice and its high time we got to know these waters with something like the respect and long-term commitment of seasoned sailors. I recommend that you go along for the ride and reintroduce yourself to the living and very much alive Great Lakes. Manno is executive director of the New York Great Lakes Research Consortium, an organization of 17 colleges and universities in New York state with research programs focused on the Great Lakes. E-mail: jpmanno@mailbox.syr.edu. For decades, residents of Libby, Mont., worked, lived and played in the vicinity of the Zonolite vermiculite mine, run by W.R. Grace since 1963. In the 1970s and 1980s, workers from the mine started to experience lung problems, and eventually, many were diagnosed with diseases brought on by exposure to asbestos. On Feb. 7, a grand jury handed down an indictment of W.R. Grace, after a five-year asbestos-contamination inquiry by the Environmental Protection Agency (EPA), stating that the company engaged in fraud, obstruction of justice and conspiracy, in addition to Clean Air Act violations, related to exposing the town of Libby to asbestos. 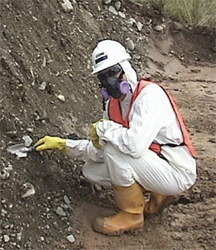 Environmental Protection Agency workers have been slowly cleaning up sites in and around Libby, Mont., that were contaminated with locally mined vermiculite containing tremolite  the most hazardous form of asbestos. A recent documentary takes viewers to Libby to see the toll the contamination has taken on the town and its residents. Courtesy of CDM. Studies of the Zonolite vermiculite (a layered clay mineral that pops when heated) found it contained tremolite, the most hazardous form of asbestos. Grace closed the Libby vermiculite mine in 1990, but not before its product had been shipped across the nation in insulation and as a soil conditioner  and after it was liberally deposited in gardens, playing fields and houses throughout Libby itself. Aubrey Miller, EPAs site toxicologist, says that so far, 1,200 of the towns 7,000 residents screened have some form of asbestos-related disease, from mesothelioma to milder lung conditions. The rates of deaths related to asbestosis in Libby are 40 to 80 times higher than in the rest of the United States. In 1999, EPA moved into the small town, eventually starting a cleanup process that involved the designation of Libby as a Superfund site. After EPA and Libby residents separately filed claims for restitution, W.R. Grace filed for bankruptcy protection in 2001. Several years of this ongoing battle have been documented in Libby, Montana, a two-hour film that follows workers in the mine, their families, and the EPA workers sent in to figure out what happened. The filmmakers, Dru Carr and Doug Hawes-Davis of High Plains Films, meticulously burrowed into some of the gritty details. They show internal Zonolite memos from 1969 that document the rates of illness of the companys workers, as well as videotaped deposition of Earl Lovick, the former manager of the mine. Lovick, who died in 1999 while suffering from asbestosis, reluctantly acknowledges in the video that the company knew about the asbestos content of its product decades before the mine closed and did not inform its workers, many of whom were his friends and neighbors. But that is the only comment in the documentary from someone at the company. The film focuses mostly on several vocal members of the community as they try to bring Libbys plight to the attention of the state government and up the chain to Christine Todd Whitman, who was then head of EPA. The second half of the films portrayal of this struggle is sometimes tedious (the documentary would have benefited from some editing), following town meetings and other dry events. But the passions underneath, including several meetings where residents try to come to grips with the potential consequences of naming their town a federal Superfund site, make viewing some of this documentary memorable. Libby, Montana was released on DVD in April. A judge has set the trial date for W.R. Grace and seven of its executives for May 15, 2006. The 264-square-kilometer Gunnison Gorge National Conservation Area (NCA) in western Colorado is one of a number of protected regions recently created by Congress to preserve unique and beautiful areas for future generations. The outstanding scenery, magnificently exposed geologic formations and recreational opportunities within the Gunnison Gorge NCA, such as kayaking, rafting, fishing, hunting, hiking and camping, attract more than 10,000 visitors a year. 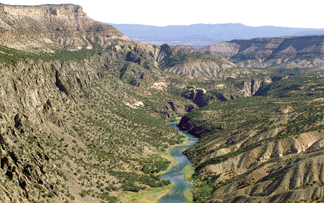 The Gunnison River canyon is in the heart of the Gunnison Gorge National Conservation Area in western Colorado. A new poster (shown below), book and map highlight the geology, ecology and human history of the protected lands. 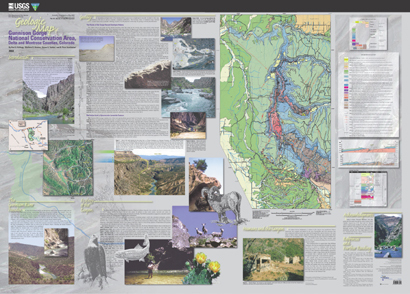 To showcase the geology of the scenic Gunnison Gorge NCA, the U.S. Geological Survey (USGS) and the U.S. Bureau of Land Management recently published a 1:45,000-scale map and companion book. Written and designed for members of the public, these colorful and richly illustrated publications still retain the scientific content to serve the needs of scientists and land managers. The geologic map forms the centerpiece of an attractive poster that describes the geology, ecology and human history of the NCA. Information for the map mostly came from detailed geologic mapping by retired USGS geologist Wallace R. Hansen. The companion book, The Geologic Story of Gunnison Gorge National Conservation Area, Colorado, includes color photographs and figures that highlight and explain many of the geologic features. One intent of the map and book is to portray the NCA as a geology classroom in which nonscientists can learn basic geologic principles. As an aid to nonscientists, all technical terms used in the book are defined in a glossary. With the geologic map and book in hand, the reader can explore and learn about the igneous and metamorphic basement rocks that form the steep inner canyon and the colorful sedimentary rocks that unconformably overlie the basement rocks. Readers can also learn why all sedimentary rocks older than about 170 million years (Middle Jurassic) are missing in the NCA, as compared to other areas in Colorado; why the Gunnison River flows through the Gunnison uplift and not around it; the origin of the spectacular Ute Indian fault, which cuts through the center of the gorge; and the fascinating history of canyon cutting that has occurred during the past 2 million years. Karl S. Kellogg, F. Craig Brunstein and Carol A. Quesenberry of USGS contributed to the Maps column this month. Call 1-888-ASK-USGS, or visit the USGS online for pdf versions of the publications, which are available separately at no charge: Click here for the geologic map and the accompanying book (accompanying book). A companion Fact Sheet is also available.